E Ink Holdings reported its financial results for 2016, with the first operating profit in five years. The company was still profitable, due to royalty earnings, but now its operations are profitable too - in 2016 operating income was NT$61 million ($2 million USD). The company's chairman says that the improvement stems from a better product mix, enhanced productivity - and the company's new asset-light policy and divestment from unprofitable business. 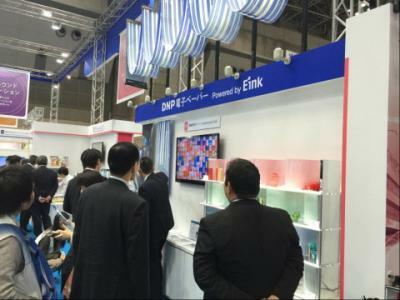 E Ink quite the LCD market to focus on its e-paper technologies. New sales drivers are e-paper displays, electronic shelf labels and electronic signages. Demand from e-reader remains stable and E Ink actually expects annual growth in that market. In early 2016 PopSlate raised $1.1 million in a crowd funding campaign to develop the PopSlate 2 - which was supposed to offer a 4.7" 800x450 E Ink display for the back of your phone. The Oaxis InkCase IVY is a smart iPhone 7 case that offers a 2.13" E Ink display that can display the time, notifications, to-do lists and calendar reminders. 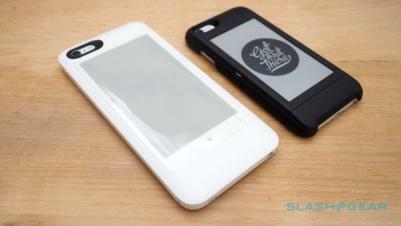 It can also be customized to show an image so to enhance the style of your iPhone case. The IVY can last up to two months between charges, and protects your phone using BubblePro drop protection tech. The IVY will ship soon and is ready for pre-order at $49 for the black and white version and $52 for the wood finish model (these prices are lower than the price after launch).